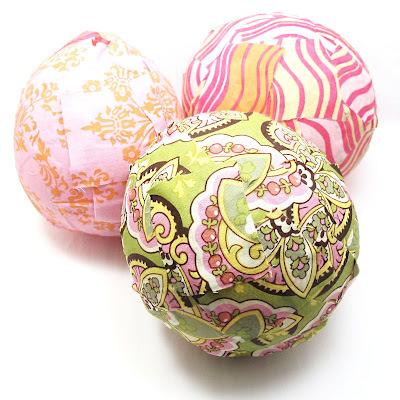 Sew Can Do: Guest Post: Fabric Maché Eggs by the decorated cookie! Guest Post: Fabric Maché Eggs by the decorated cookie! It's an all new season, so time again for a little blog swapping! While I'm stopping short of actually using needle and thread, I thought I would dabble a bit in Cheryl's medium (fabric) and step away from sugar (my medium at the decorated cookie). This concept of papier mache-like Easter eggs from balloons isn't new, but I had a hard time finding instructions on making them with fabric, so I made my own. Still not perfect, but I can assure you these are better than my first two versions. You can leave them as-is or cut them open to make dioramas. While the fabric stiffener I used is non-toxic, I'm not so sure it's food safe, so I would use these as decorative pieces only. 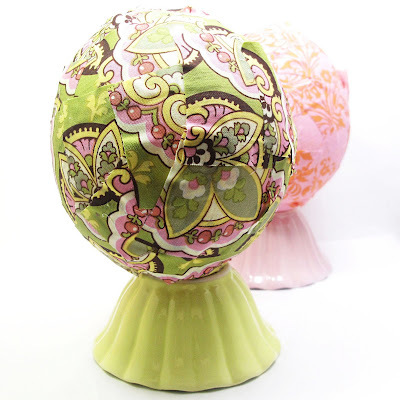 *I used Amy Butler's fabric, a great choice for the right thickness and pattern options. I used Aleene's Fabric Stiffener and Draping liquid, found in craft or fabric stores. Hmmm, it looked a lot like white glue, so I'm wondering if you can substitute any white glue that dries clear. The clips are just to hold the balloons. I used chip bag clips. You can also use clothespins, binder clips, whatever. Lay a piece of wax paper over your work surface. Blow up balloons just enough to create an egg shape and tie knots at the end. Cut your fabric into squares about 1 1/2 inches (I was not exact, and didn't measure). Cut out a bunch of these so you don't have to cut out more with gluey hands. 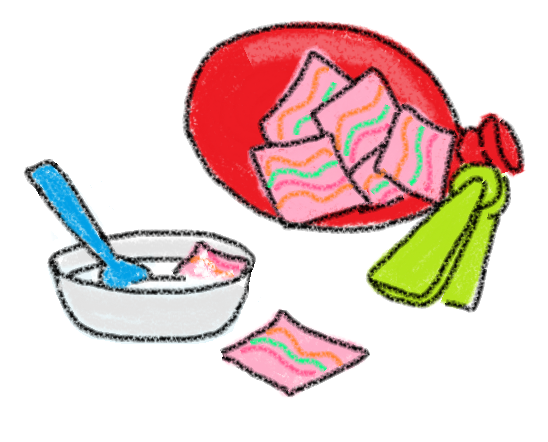 In the plastic bowl, stir equal parts fabric stiffener and glue. You'll need a couple teaspoons of each per balloon, depending on the size of the balloon.Clip each balloon knot with a clip. This will help steady the balloon. Suspend the string somewhere free of kids, pets and other curious beings. 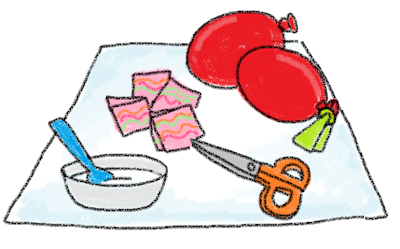 Wearing gloves, submerge a square of fabric in the glue mixture, slide the square through your fingers to remove the excess stiffener mixture, and place the square on the balloon. 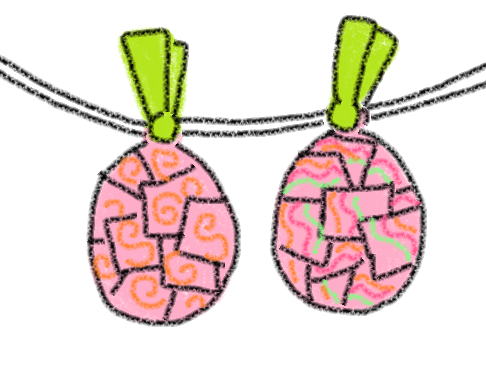 Repeat, overlapping the squares, until the entire balloon is covered. I used a paintbrush to help smooth the edges, but you can also use your fingers. Clip onto the string to dry overnight. The next day, cut off the balloon knot and let the balloon shrivel up inside the egg. If you're really attuned to detail (I'm not), you can glue another fabric square on top to cover the hole. 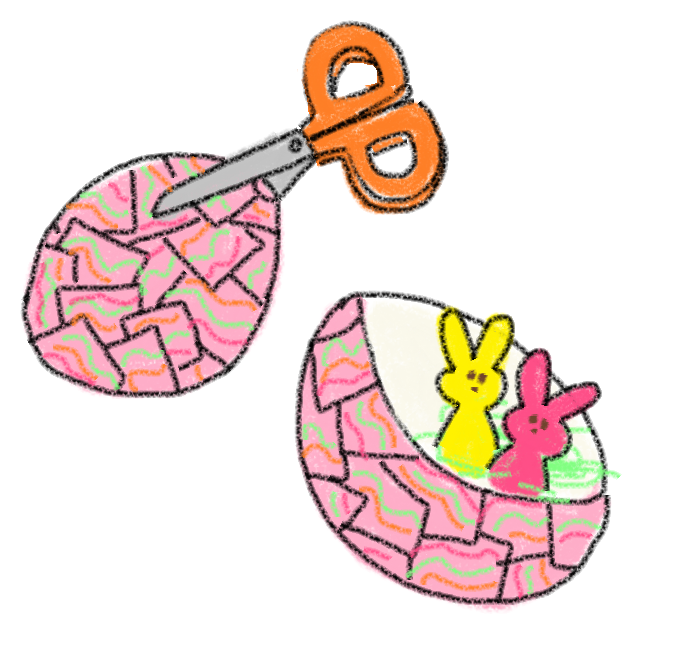 Or, starting at the hole, use your scissors to cut out a section of egg to make a diorama. Thank you Cheryl and all your readers for letting me visit! Happy Easter everyone!! And thanks to Meaghan for the awesome idea & tutorial!! Those are so cute! I think my girls would LOVE making those! You could actually combine your sugar medium with fabric on this project, just use sugar syrup to stiffen the fabric instead of the purchased stiffening product!! Just heat 2 parts sugar to one part water and cook/boil until the sugar dissolves. Be really careful while it is hot!! I LOVE these! 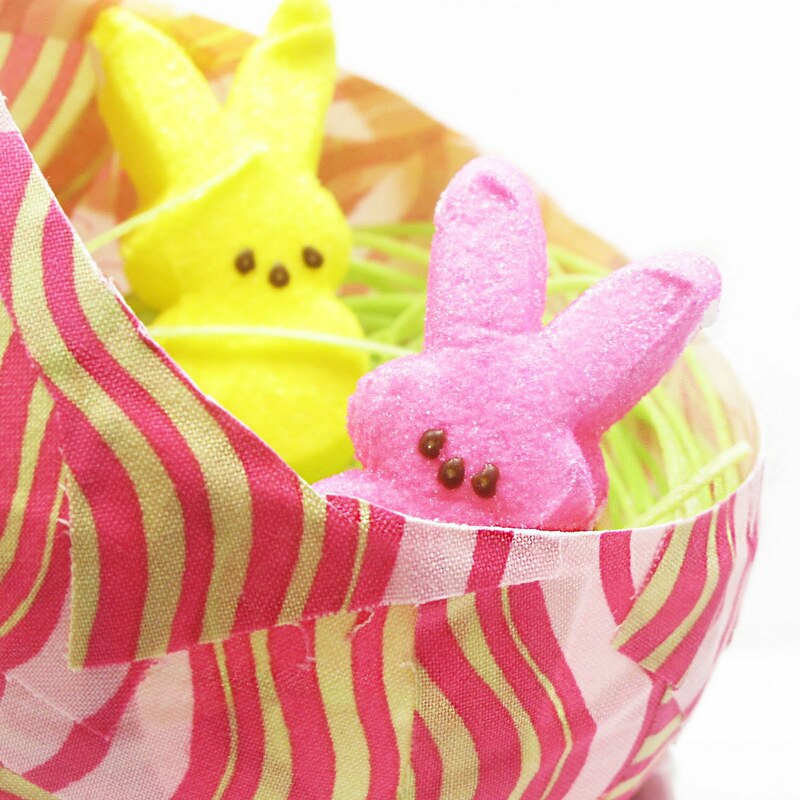 What a fun way to use fabric! Thanks so much to both of you, I'll be linking. 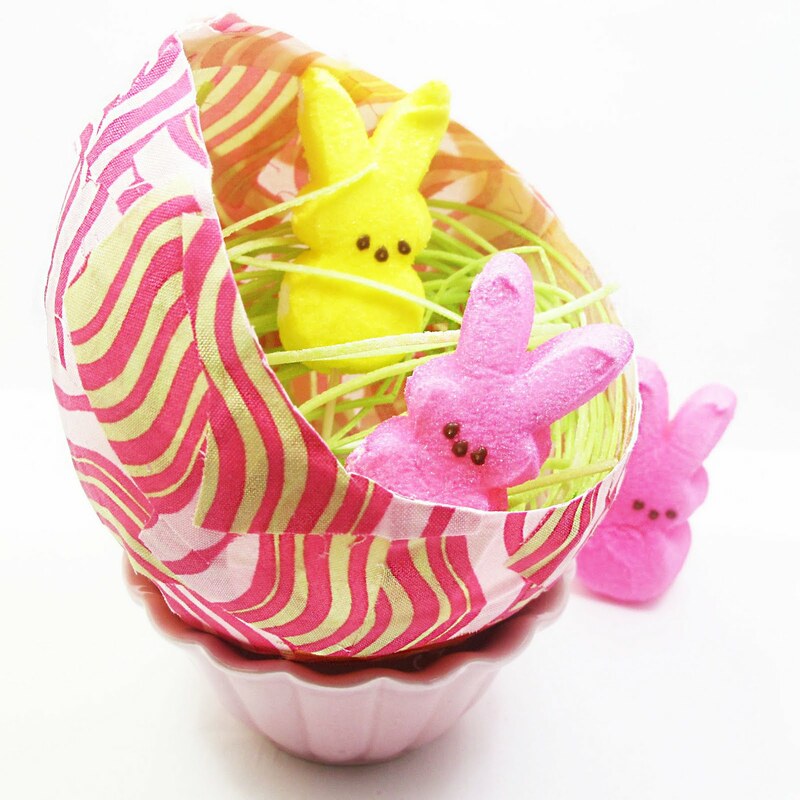 You should put them in a little basket with Easter grass. Very colorful and cute. Creative and fun.